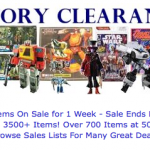 We’ve got the latest update from site sponsor BigBadToyStore! Don’t miss out on their overstock sale! They’ve got plenty of new arrivals and preorders too, read on to check them out!